Early December visitors to the Old Tarble art studio were startled to find a looming three-dimensional rendering of the Thomas Eakins painting The Gross Clinic—created by students in Assistant Professor of Studio Arts Logan Grider’s first-year seminar Making Art. 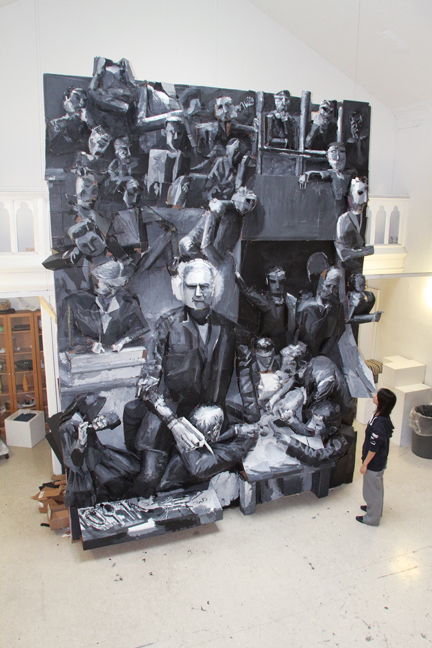 [watch: time-lapse video] The students reclaimed a week’s worth of cast-off cardboard from campus Dumpsters, then used utility knives, hot glue, and black and white paint to build the 16-foot-high interpretation of the painting. In preparation for the assignment, one student had studied Eakins’ painting in Scheuer Family Professor of Humanities Michael Cothren’s first-year seminar Making Art History. Then the class viewed the actual work on display at the Pennsylvania Academy of Fine Arts and visited the Inova Heart and Vascular Institute, near Washington, D.C., to observe and sketch a double-bypass surgery. To create the images appearing in the painting, students made photocopies of their own faces, which they fashioned into three-dimensional figures for the piece. Both sections of the course worked on the sculpture, which resulted in some students’ work being altered or even taken apart by members of a later class. Taking about two weeks to complete, the result was awe-inspiring and decidedly sinister—dominated by the huge figure of Dr. Samuel Gross, who seemed to step out of the work brandishing a huge scalpel like a weapon. By mid-December, with glue beginning to loosen its hold, the ephemeral work was ready to be taken down—“otherwise, it will come down by itself,” Grider said—and returned to the dumpsters whence it came.